You have probably read elsewhere on this site about one of the benefits of a breakfast nook set being extra storage space. The most common way that a breakfast nook can give you storage is if there are storage benches. The seats of your breakfast nook bench seating will lift up like a lid revealing storage compartments beneath. There are two different varieties of storage benches in the breakfast nook and this post will look at both. The first variety of storage bench is one that resembles a large storage chest. In other words, the storage area goes all the way to the floor and gives you a very deep storage container. One example is the Hampton Bay breakfast nook set by Home Decorators Collection. This kitchen nook set is a corner breakfast nook with storage in the corner bench seat. The lid is equipped with safety hinges so that is closes slowly and you do not run the risk of little fingers getting caught in a closing lid. The furniture from Home Decorators Collection comes in a hazel brown color pictured here as well as white and natural wood. The corner breakfast nook style turns a square table for four into a table for five or six because of the spacious corner bench seats. The biggest benefit of this variety of breakfast nook with storage benches is the large amount of storage space. However, the chest like benches are large and bulky and would not work well in a modern kitchen where open space is a theme. Another kind of breakfast nook with storage benches is one where the storage does not go all the way to the floor. Instead, the breakfast nook benches with storage are only four to five inches of storage. 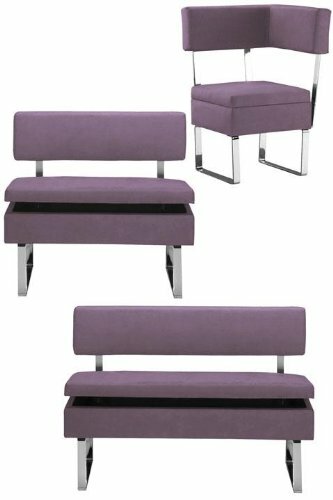 One example is the Soho Delfino breakfast nook set. This breakfast nook with storage benches is also a corner nook style. The corner bench setup actually comes in three pieces. The corner piece does not include storage, but the two and three person bench seats include storage. This breakfast nook with storage comes in a variety of colors for the microfiber upholstery. The picture below shows the eggplant color but it also comes in red, brown, and white as seen to the left. While you do not have as much storage space, this variety of breakfast nook with storage benches is more subtle. It is not as obvious to the common observer that there are storage compartments and that can be important for a modern kitchen nook.